Designing an office at home when you’re short on space can be a challenging task. 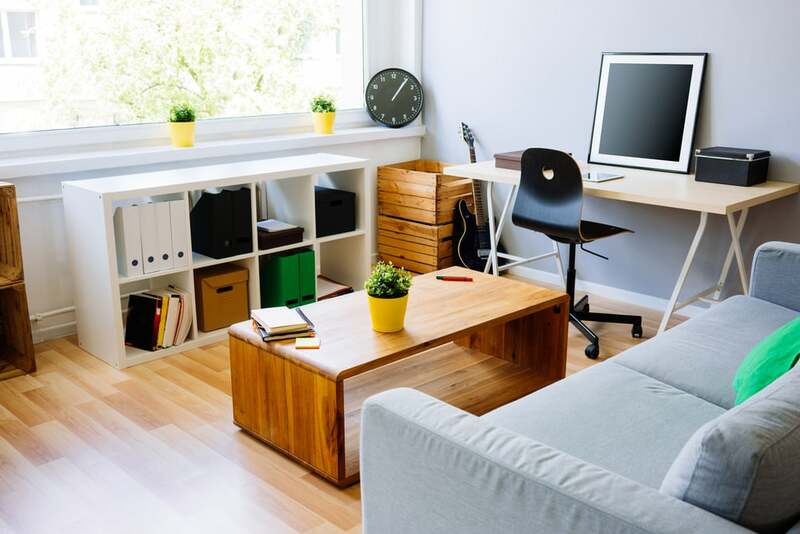 Given the more flexible working practices nowadays, it’s understandable why many people opt for setting up an office in their own living space. Dedicating an entire room for a large office is usually beyond the possibilities of many homeowners. 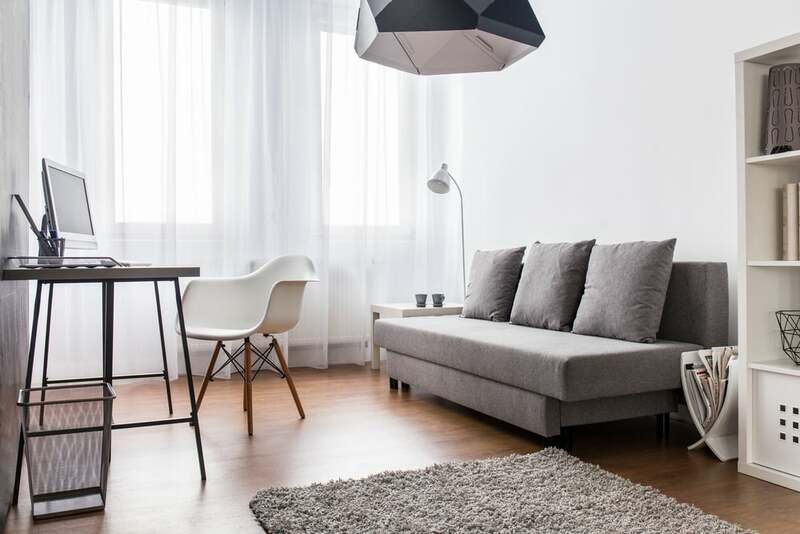 While there are some space restrictions, this doesn’t mean you can’t put a bit of creativity to work and carve out some extra space to work efficiently in your own home. It’s also important to learn how to decorate a small home office to maximize productivity and create a more engaging atmosphere. 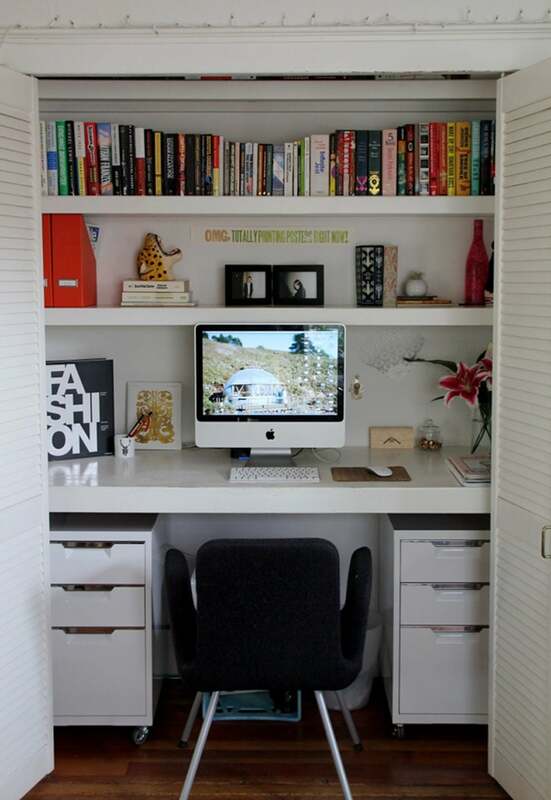 A great way to design your small home office is to use a specific zone from a room. 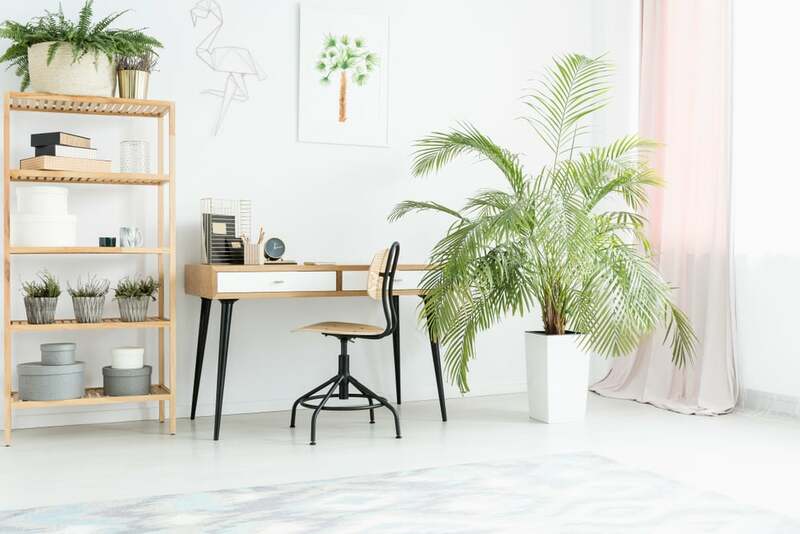 Whether you find the space in a guest bedroom or the living room, your office zone can start to take shape by simply adding a sleek and minimalist office desk and a few storage solutions. Instead of going for classic office furniture, you should select furnishings that match the look of the room to achieve an effect of blending in. When space comes at a premium, it’s a good idea to make the most out of the existing square footage. A nice storage solution for a small home office is to install modular shelving on the wall. All your office supplies can stay organized in boxes and you can add more shelves to display some prized possessions as well. Having a small home office simply means that you need to work with the existing space to make it as multifunctional as possible. There is no rule about home offices having to be self-contained spaces. 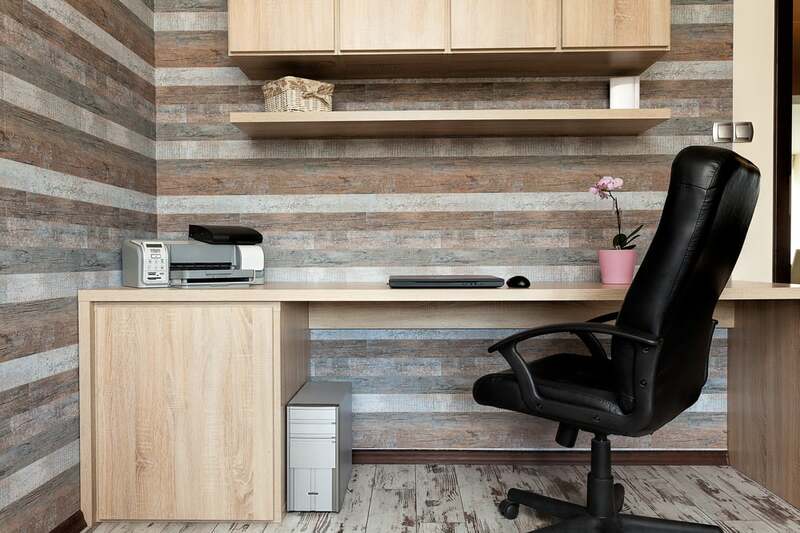 Certain neglected areas in your home can easily be modified to fit your office essentials. A great example is the space under the stairs. Chances are that this is a highly underutilized area where a small office could fit perfectly. 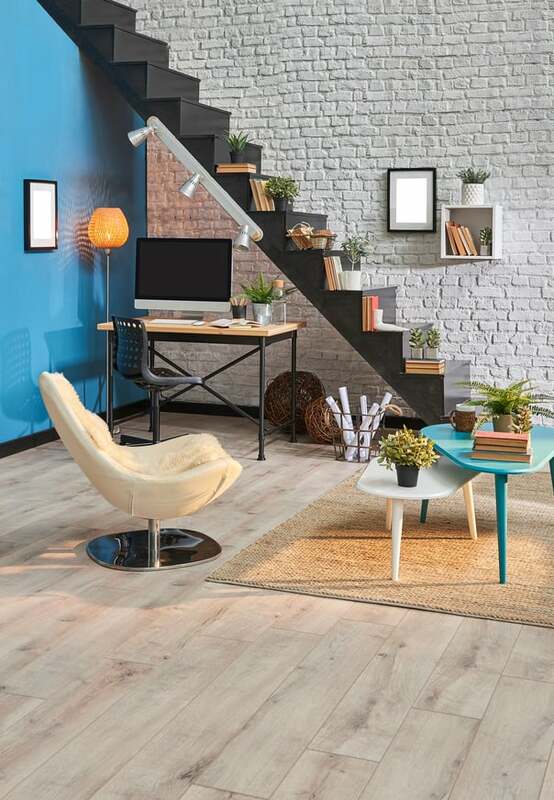 Try to personalize this space or integrate it better with the look of the rest of your home to make it feel less makeshift. Working from home means you can take a more flexible approach to the look of your small home office. If you’re a more health-conscious person, you’re probably aware of the risk of sitting for too long. Being able to stand at a desk can make you feel more refreshed and inspire you to move around and avoid sitting for extended periods of time. For this reason, it’s a solid idea to try a DIY workstation that integrates a bar height desk where you can both sit or stand at comfortably. Similar to the idea of making better use of the space under the stairs, you could find a spare closet in your home that you can dedicate to a small home office. It just needs enough space to accommodate a small desk. Then you can add some wall shelves to add various objects like books and documents. If you feel like the look of the closet is too gloomy, perhaps painting the walls in a brighter color could help you work more productively. One great advantage of transforming a closet into a small home office is that it can be used as a separate room so you can get some privacy and also keep the area concealed by shutting the door when not in use. Saving floor space can be done very easily with the help of a loft bed. You can configure it in such a way to place a small workstation underneath the bunk bed. This idea works best for a children’s bedroom, but you can also do it for an adult bedroom. 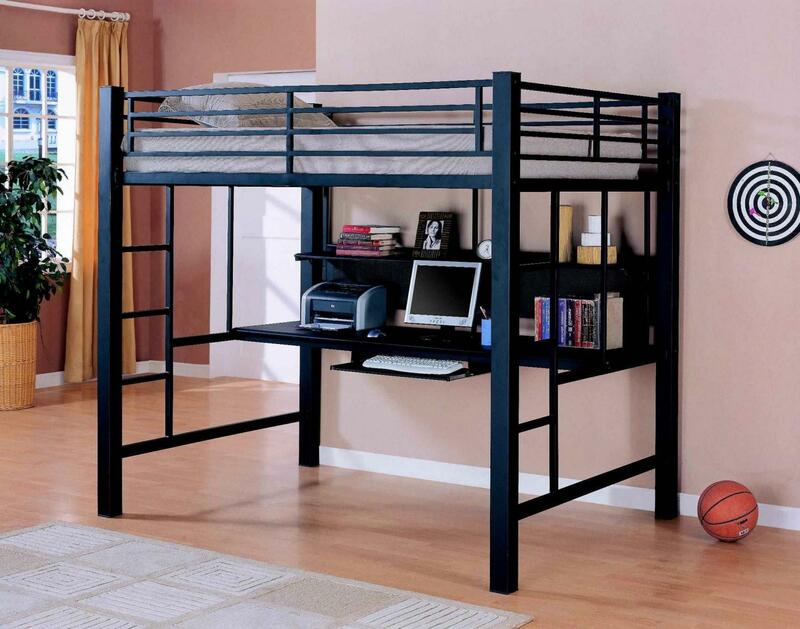 Space can be used in a smarter manner thanks to a loft bed which is designed to have some storage space. The desk is usually the main element that makes your small home office immediately noticeable. If you wish to create a more unobtrusive look, perhaps investing in a glass desk would be an excellent solution. When you’re not using it, it will virtually become invisible for the rest of the room. Take a look at this glass desk from Amazon which seems to be an ideal piece to include for an unobtrusive home office. 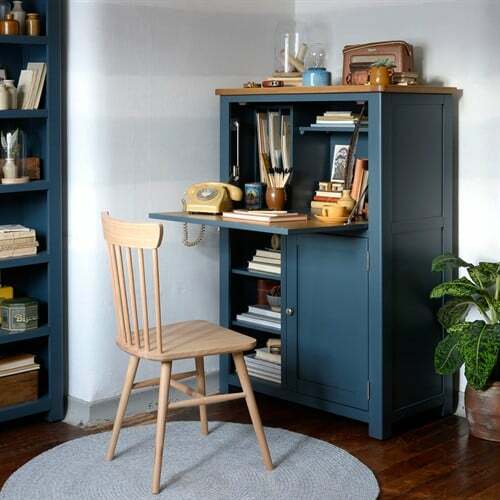 An interesting idea to try if you want a quick home office is to go for an all-in-one model like this small bureau from Cotswold Co. It has lots of storage options and a convenient desk area which can be easily folded away when your work is finished. This means you can save a lot of space especially considering how you can easily integrate the bureau with the rest of your furniture. 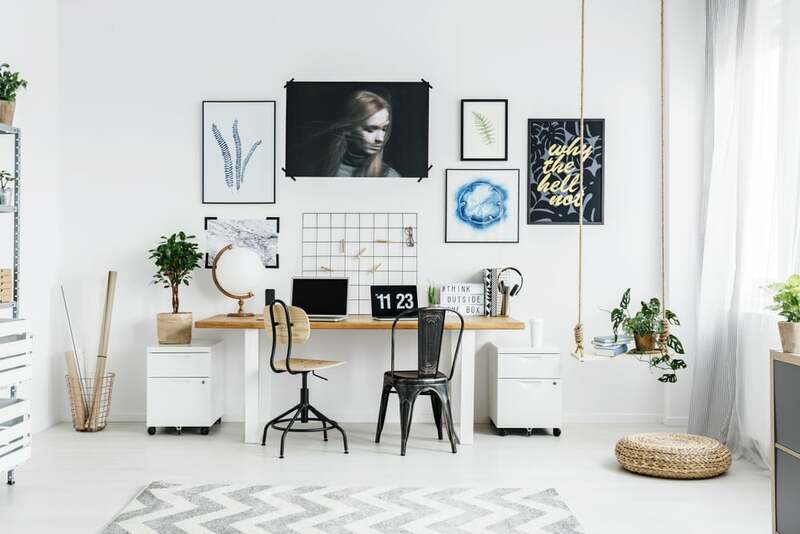 A somewhat unusual place for including a home office, the hallway could be considered if the layout of your house enables you to take advantage of some unused space. An L-shaped desk might be a perfect addition for the hallway if you wish to optimize the available space. 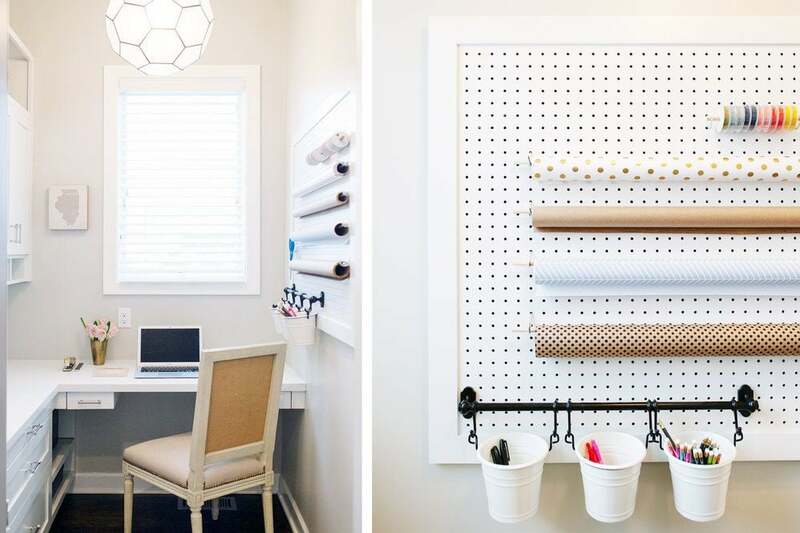 Installing a pegboard on the wall could be beneficial to store some office items. Your work area could be considered a personal space and that means you can safely include it in a low-traffic area from your home like the bedroom. If you plan on sacrificing a small area from this room to add a small office, perhaps it would be a good idea to make it more personalized. As opposed to the office at your workplace, there are no rules in place so you can customize the look of your shelves to add a splash of color and make your working sessions more enjoyable. A small office nook in your home can definitely make use of a personal touch. Lots of decorative elements can be incorporated to make this spot more lively. We recommend going for a stylish wallpaper to add a unique twist to an otherwise more formal area in your home. Another idea is to add some racks on the wall to store magazines. Some natural elements like potted plants can turn a small home office place in a more pleasant area. 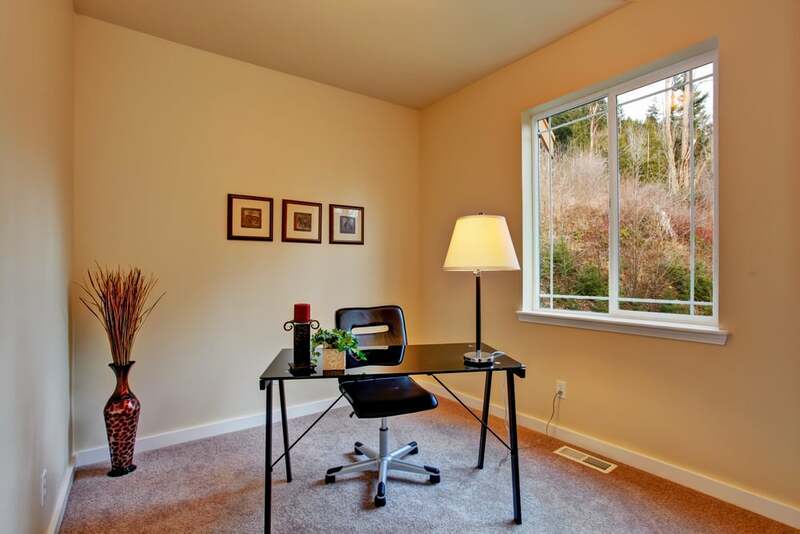 An unused corner in the room offers a nice space that can be put to good use for a small home office. Just add a desk that fits with the style of the room. It’s recommended to opt for a corner between windows to allow you to take advantage of natural sunlight. Having a beautiful view can also affect your mood in a positive manner. If you wish to decorate your small office and make it seem more feminine, the best way is to paint the walls in a trendy shade like rose quartz. With the right furniture and accents to complement the color, you can obtain a very sophisticated look for any office nook. To avoid the childish look, the pink walls need some furniture in matching tones. 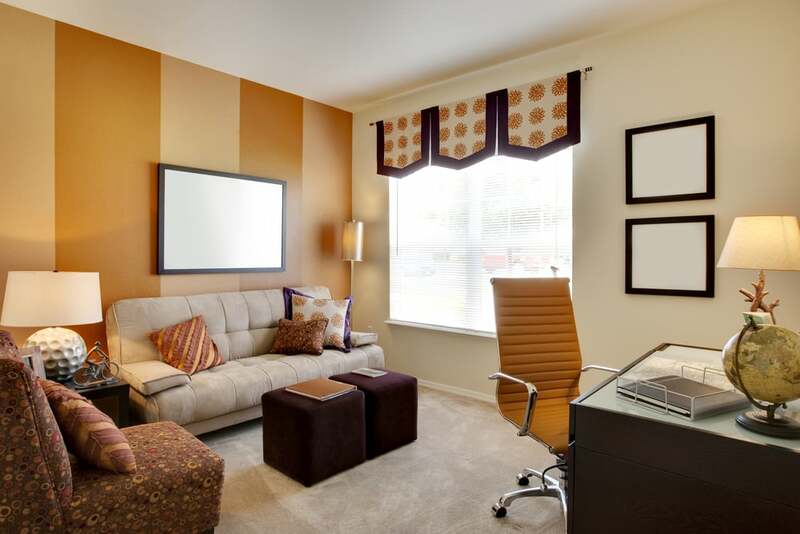 We recommend keeping the color scheme balanced with some gold accents as well as cream and brown elements. 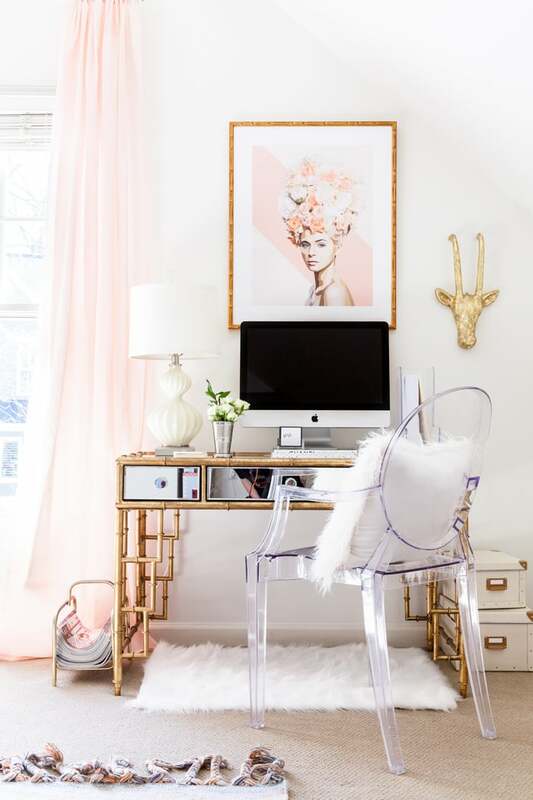 This is the ultimate marriage of beauty and style for a truly feminine-looking office. Small offices require adequate furniture to create the illusion of extra space. A solid addition in that regard is represented by the ghost chair. With a nearly invisible look, this chair will make the office zone have an airy atmosphere. Finding the ideal balance between quality and cost is a fairly difficult task when it comes to ghost chairs. Check out this reliable model from Amazon if you’re interested in obtaining this look for your small home office. Being able to work from home automatically means you can get through your task in a less stressful manner. 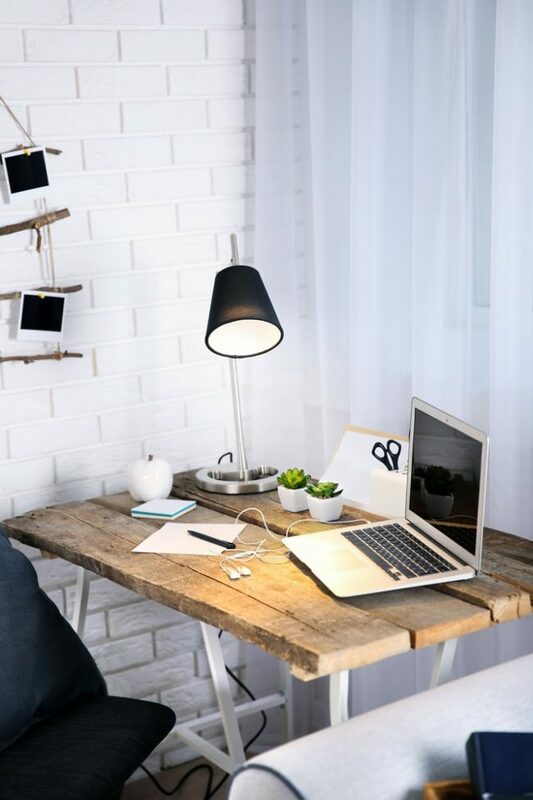 You can work more comfortably if you bring a little hygge décor into your small home office. The idea is to find some balance between too much coziness that may impact your productivity, and enough welcoming elements. Add plenty of natural wood and some neutral colors for a warm and pleasant atmosphere. 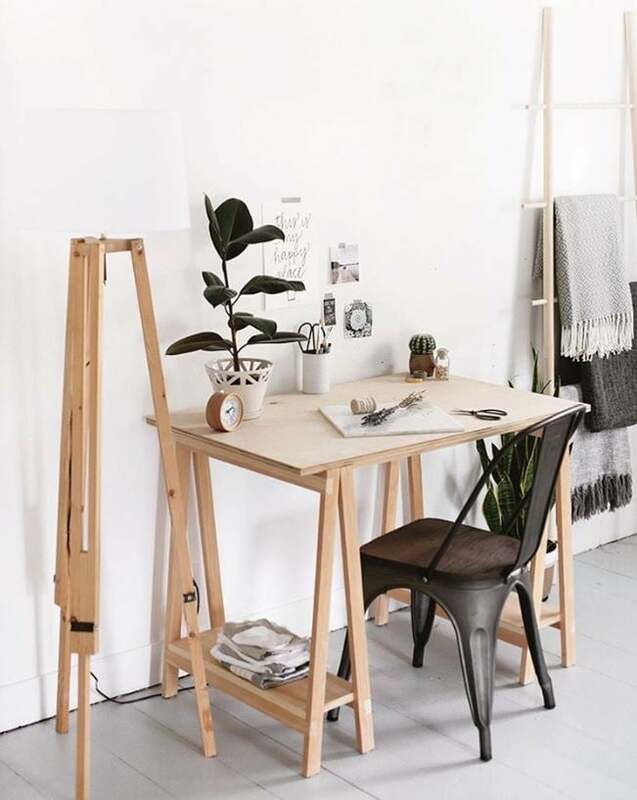 Placing a ladder with soft blankets near the desk can contribute to the cozy vibe of your working space. And go for wool blankets when you need something fitting for the winter months. If that neutral wall in your home office feels too bland, a great decoration tip is to fill it with interesting prints. By creating a gallery wall you can transform the look of the wall and add a personal touch. It’s all about finding some art pairings that get you in the right mindset to maximize productivity when you work from home.